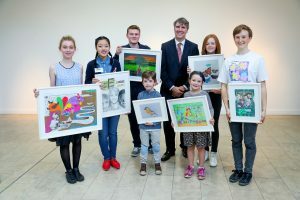 The Ombudsman for Children, Dr Niall Muldoon opened Rights in their Eyes an exhibition of works by the winners of the 63rd Texaco Children’s Art Competition at the Royal Hibernian Academy, Dublin. Rights in their Eyes is a collection of works reflecting children’s rights in Ireland as seen by the young artists who range in age from 6 to 17. This exhibition is the first of many activities planned by the Ombudsman for Children’s Office (OCO) to mark 25 years since Ireland ratified the UN Convention on the Rights of the Child (CRC). The images created by the young people will be used throughout the year reflecting children’s own views on rights in Ireland today. “These art pieces give a snapshot of how the young people view children’s rights today. The images range from family to play to the stress children feel in their everyday lives. “The young people themselves put it best when they outlined the inspiration behind their pieces. Lucy Deegan (17) who created a piece depicting her friends looking out an old railway carriage door explained how she felt her friends were experiencing enthusiasm and joy, depicting a child’s right to play. “In Amy Zhao’s (12) drawing a young girl is trapped between two phones. Amy says ‘we are trapped in our phones, just like prison. Maybe that’s why they’re called cell phones’. She says ‘family times are definitely more valuable than devices’. “The 25th anniversary of the UNCRC in Ireland is a time to consider not only the progress that has been made in the area of children’s rights but also the work still to be done. “Since 1955, the objective of the Children’s Art Competition has simply been ‘to support and encourage children through art’.